Attention-deficit Hyperactivity Disorder (ADHD): The Integrative Mental Health Solution includes extensive hyperlinks within the text, and links to valuable internet resources to give you the maximum amount of information in the shortest amount of time. "ADHD is a disabling illness for many individuals, particularly families with children who are placed on various medications without an understanding of the multiple factors that could be contributing to their child’s poor attention and lack of impulse control. 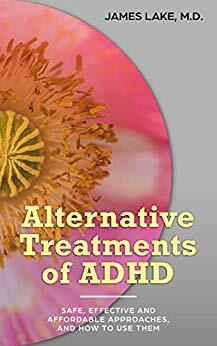 Dr. Lake’s book is by far the most comprehensive written overview summarizing integrative therapies for ADHD that I have seen in over 25 years. This book is a gift to readers as it provides useful information supported by scientific evidence that can be readily incorporated into clinical practice. Dr. Lake summarizes the dense and often confusing scientific research on several integrative therapies available for the treatment of ADHD with a 3 tier approach: (1) treatments supported by strong research evidence; (2) frequently recommended treatments by healthcare professionals but supported by less evidence; (3) treatments that may be effective and should be considered despite weak research evidence. In each approach, Dr. Lake provides a concise synopsis on the treatment therapy along with practical recommendations. The scope of information presented is simple to grasp, and is organized in a way that is not overwhelming for readers unfamiliar with integrative medicine. I would highly recommend this book to any professional or parent who is interested in learning about how integrative therapies can benefit their patients or family member."